What is TonidoPlug2 Home Server? TonidoPlug is a tiny, low power, low cost home and small-business server that allows you to access your applications, files, photos, music and media from anywhere via a web browser or mobile applications. You can effortlessly access and share your TonidoPlug's files through native iPhone, iPad, Android, Blackberry or Windows 7 mobile apps. TonidoPlug comes pre-installed with powerful Tonido Applications - Explorer, WebsharePro, Search and more - all running on top of embedded Linux OS. Additionally, TonidoPlug can be extended by installing new thirdparty applications from the Tonido App store. Applications and data are always local with the TonidoPlug. Your data and applications are available even if there is no internet connection available to your TonidoPlug and your plug continues to work. When an external USB hard drive or internal SATA drive is connected, TonidoPlug2 converts it to a NAS storage accessible from Windows/Mac/Linux computers in the local network. When you are outside your local network, you can still mount TonidoPlug folders as local drives using free TonidoDrive software (for Windows) or by using WebDAV for drag-and-drop download and upload support. You can even stream media to some UPnP/DLNA compliant devices like the XBOX 360 or PlayStation 3 (Beta). anywhere via a Web browser or through native apps for iPhone, Android, Blackberry and Windows 7 mobile. Share your files, photos, music with guest users. "I received my plug an hour ago. I set it up in less than 5 minutes. The quick start guide is great. I'm in love with this. I will definitely tell my friends about this for Christmas presents." "This idea of a green server is just right. I am sending a box I was using for a similar purpose to the dumpster. I am sure I will be saving some dollars and pay for the TonidoPlug in a few months." "For just shy of $100, the TonidoPlug sells itself. It's an amazing little device running awesome software which supercharges your external hard drives with a ton of networked potential." 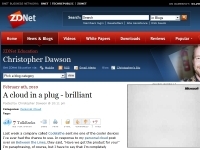 "I highly recommend getting a TonidoPlug. It's incredibly fast, easy to configure and use, and will use a lot less power than my PC did staying on 24/7 (serving up shares for the family)." "I have been running one of these for a few weeks now, definitely awesome. I have all my external drives hooked up to it and sharing on my network." "This has got to be one of the most impressive and versatile things I've laid hands on." Dimensions (L*W*D): 5.5"* 3" * 1"